I just finished the last border on my In my Garden quilt top and I'm getting ready to take it to Terri to have it quilted. You may recognize the blocks from earlier post in 2011. This is a quilt designed by Anni Downs owner of Hatched and Patched. I love her patterns. That is absolutely beautiful- the colors are really pretty. 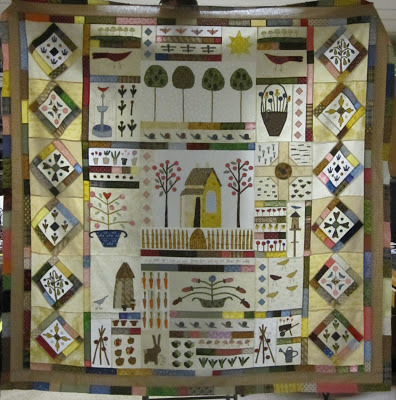 What a great quilt to have done for springtime ! Nice job Bobbie. Thanks Colleen, It was a lot of fun putting it together, trying to find that perfect fabric for each item! It is even better looking in person! Thanks Terri, I know its in good hands! !